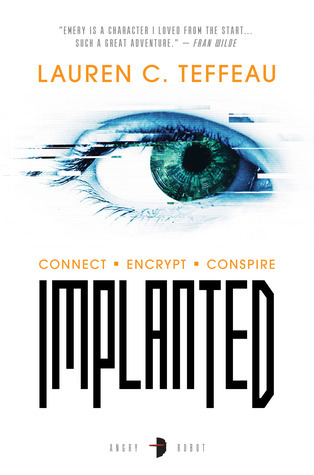 Today I am interviewing Lauren C. Teffeau, author of the new cyberpunk novel, Implanted. DJ: Hey Lauren! Thanks for agreeing to do this interview! 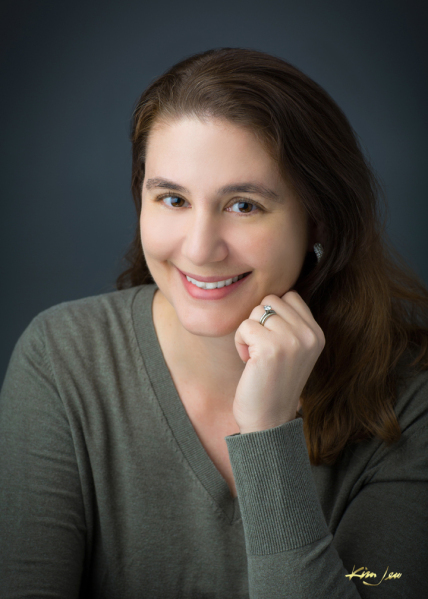 Lauren C. Teffeau: I’m a speculative fiction writer from New Mexico. I grew up on the East Coast in the suburbs outside of Philly, went to undergrad and graduate school in the South, worked as a university researcher in the Midwest, and now live in Albuquerque. I love writing and reading (natch! ), biking, hiking, video games, and spending time with my family. DJ: What is Implanted about? Lauren: The book is about a young woman named Emery Driscoll who’s blackmailed into working as a courier for a shadowy organization and what happens when the life she was forced to leave behind comes back to haunt her after she’s left holding the bag on a job gone wrong. Action and adventure abound, along with high-tech gadgets, light espionage, romance, and hard questions about the future. DJ: What were some of your influences for Implanted? Lauren: Take Johnny Mnemonic, add a dash of Person of Interest, mix with Logan’s Run, and wrap it all up in a Blade Runner-meets-solarpunk aesthetic. DJ: Could you briefly tell us a little more about your main character Emery? Lauren: Sure! Emery has just graduated from the prestigious College of New Worth and is debating whether she wants to meet one of her close friends in person for the first time after years of synching via their neural implants, which allow for the near-instantaneous exchange of thought-text. (Hello, cyberpunk!) But after growing up in the Terrestrial District, Emery’s slow to trust, even though they have so many things in common, including a love for the city’s Arcades where their implants pair with the latest cutting-edge tech for super-immersive games like the one that introduced them in the first place. She also has a BIG secret she’s been keeping from him, and most everyone else in her life, making her easy prey for the folks wanting to turn her into a courier. DJ: What is the domed city of New Worth featured in Implanted like? Lauren: Humanity has had to retreat into domed cities to survive the climate apocalypse. Roughly two generations later, New Worth is still standing but is highly stratified, with the wealthiest living out their lives in the Canopy levels closest to the sun, the poorest eking out an existence in the dark and gloomy Terrestrial District, and everyone else in the middle trying to make a go of things in the Understory. The neural implants were intended to placate the people who had to leave their homes behind and live under the dome, but now they rule everything in New Worth, which has led to de facto discrimination against the people who can’t afford the tech or the advantages the city’s network represents. DJ: What was your favorite part about writing Implanted? Lauren: There are so many things I enjoy about this book. One of them is how I was able to focus on sustainability and hyperconnectivity. The former I believe in passionately, and the later feeds in my academic background. I hold a master’s degree in mass communication and worked as a university researcher examining different populations’ use of internet resources. As a result, I have opinions thanks to those experiences, and they informed a lot of the book’s underlying assumptions when it comes to connectivity. DJ: Did you have a particular goal when you began writing Implanted? Was there a particular message or meaning you are hoping to get across when readers finish it? Or is there perhaps a certain theme to the story? Lauren: I always hesitate to describe the take-home message of anything I write, only because I’m a huge believer that the story should stand on its own once its published. Blame it on all the critical and cultural studies analyzing textual objects I did in grad school. But in addition to exploring issues of connectivity, sustainability, I wanted to write about a high-tech future and how such technological advances impacts relationships of all kinds, depending on the person, the environment, and/or the mode of communication. DJ: When I read, I love to collect quotes – whether it be because they’re funny or have a personal meaning to me. Do you have any favorite quotes from Implanted that you can share with us? DJ: Now that Implanted is released, what is next for you? Lauren: I’m hard at work on a few sekrit projects, which may or may not include a sequel to Implanted. DJ: Before we go, what is that one thing you’d like readers to know about Implanted that we haven’t talked about yet? Lauren: The design of New Worth’s Canopy was heavily influenced by my trip to Barcelona, Spain. Numerous buildings epitomize a style of architecture called Modernisme, essentially the Spanish version of Art Nouveau that emphasizes organic shapes and inspiration from nature. Antoni Gaudí is perhaps it’s best known practitioner, and I spent hours walking through the buildings he designed scattered throughout the city that have been preserved. Once Sagrada Familia—a cathedral that’s still under construction in accordance to his wishes—is completed, I can’t wait go back. Lauren: It was my pleasure! She is represented by Lana Popović of Chalberg & Sussman.